Bombay Jayashri and T. M. Krishna in concert. Founder of multiple successful, film related ventures like JS Films and Real Image Media Technologies, Jayendra has been in the ad film and film making business for the better part of three decades. A pioneer who got the Indian advertising industry to look to Chennai for ad film making, Jayendra is behind the conception and creation of many extremely successful advertising films and campaigns. He has also helped create compelling social awareness films for various NGOs including We Can, The Banyan and Shankara Eye Hospital among others. "For over four years, I have been living with the idea of giving Carnatic music an evocative new appeal in terms of presentation. Finally, the technology became available to give this dream the right shape. Margazhi Raagam brings together two things that are close to my heart – music and cinema! I am sure that classical music and cinema will see the benefit of this initiative, as will artistes and music lovers." H Sridhar is the Chief Audio Engineer at Media Artists. A mathematics graduate, with keen interest in electronics and formal music training, he started a professional sound engineering career in 1988. He has engineered over 200 films so far and has worked closely with directors like Mani Ratnam, K Balachandar, Bharathiraaja, Shankar, Kamal Hassan, P C Sreeram, Priyadarsan, Sibi Malayil and Ramgopal Varma. We regret to announce the sad demise of our beloved H. Sridhar in Chennai on 1.12.2008. He is deeply mourned by family, friends and all of us at Media Artists and Real Image. Among Sridhar's many professional credits is the fact that he engineered all songs and background scores for the renowned music director A R Rahman. Sridhar has been awarded the President's Gold Medal (The National Award for Best Audiography) four times: for the film Mahanadi (1994), Dil Se (1999), Lagaan (2001) and Kannathil Muththamittal (2003). 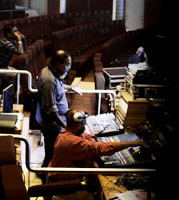 Having pioneered the use of Digital Sound for Indian films in the DTS format, Sridhar has also engineered and mixed albums for international artists like George Harrison of The Beatles, John Neptune Kaizan, Pandit Ravi Shankar, Zakir Hussain, L Shankar and John McLaughlin (Mahavishnu Orchestra & Shakti fame). Cinematographer and film director P.C. Sreeram is a graduate of the Madras Film Institute. He is known for his frequent and brilliant collaborations with director Mani Ratnam, and their combination has pioneered some innovative cinematographic techniques in Indian Cinema. 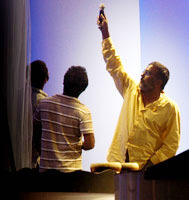 He has won many awards including a National Film Award for Best Cinematography for his work on the film Nayagan. His recent venture, Cheeni Kum was very well received by the audience and critics alike and he has made a name for himself as one of the best cinematographers in the Indian film industry. Aghal Films is a new initiative of C.Srikanth - a stock broker who is passionate about classical music and cinema. Aghal Films’ first initiative, Margazhi Raagam coincidentally brings together both these passion. Aghal Films has set out to create many such productions in the coming years. Real Image Media Technologies is India’s leading provider of technology in the film, video and audio domains and has pioneered several technology revolutions over the last 20 years. Established in 1986, the company started out by bringing together the leading sound mixing facility in the country - Media Artists - and one of the well known ad film makers in India – JS Films. The very first studio to obtain THX certification in the country, Media Artists has always been the first to adopt new technologies and tools to enhance quality of work. It comprises of experienced sound engineers and technicians, providing quality services and facilities for audio post-production. JS Films, which got the Indian advertising industry to look to Chennai for ad film making, has produced over 450 commercial films from conceptualizing to the final product. Several well-known national companies, advertising agencies and brands have placed their trust in JS for their film production. 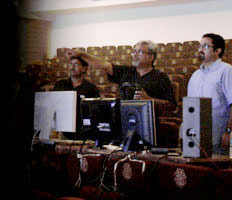 Real Image was also instrumental in bringing computer-based digital non-linear editing to India with Avid Technology, transforming the industry and forever changing the way Indian film and television programs were edited. Real Image subsequently brought digital cinema sound to India with DTS and helped Indian cinema leapfrog a generation, form mono sound directly to digital. The company is the unrivalled leader in the Broadcast arena and is the Indian representative of several global entertainment technology players such as Avid Technology Inc., Digidesign, Softimage, DTS, Orad Hi-Tech Systems Limited and Digital Vision. With its Qube Cinema end-to-end digital cinema product line, Real Image has made an impact worldwide. Qube systems are in use in over 14 countries across North America, Europe and Asia.